Atlantis Discovered is a unique store. We have constantly ever changing inventory. You’re not likely to see the same thing twice. We have gifts and jewelry that you’d be hard pressed to find anywhere else. Atlantis-Discovered is a gift box full of unique finds from all over the world. As often as our inventory changes dictates how often the decoration of the store changes. In addition to regular changes to decoration with new inventory, Atlantis Discovered makes a special effort to decorate for the holidays, especially Christmas. We currently have Masks for Parties, Masquerade Balls Fiesta, and Mardi Gras. Costumes are really big now. We have a selection of costumes for use all year long. They’re not just for halloween anymore. 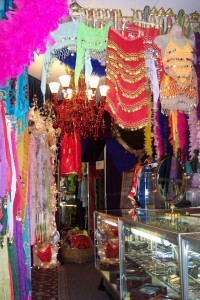 Belly Dance Accessories, Women’s Jewelry, Men’s Jewelry, Gothic Jewelry, Tiaras for Brides and Quinceaneras, Shawls & Robes, Clothing, Fairy Art, Mermaid Art, Zodiac Art, Religious Art and Iconography, Egyptian Art, Dragon Art, Stained & Leaded Glass, Knives & Swords, Feathers & Boas, Quartz Crystals, Incense & Burners, Oils & Burners. This is just a small sampling. In addition, we are also home to San Antonio Bridal Jewelry and carry more traditional lines of Bridal and Prom Jewelry, from Tiaras, to Necklaces and Earrings. You can visit our other website for San Antonio Bridal Jewelry, or see an exclusive tour here. t’s hard to just classify Atlantis Discovered as a gift store. We have so much more that you’ll likely want to buy for yourself. Since so much of our stock is unique, our inventory changes constantly. Come by often. We will soon also have a new ONLINE store, selling some of our more popular items. 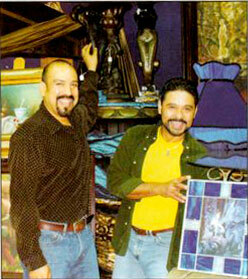 Michael Tijerina and Humberto Lizarraga. We started our business in Pasadena California, which at the time was an antique store. After several years in Pasadena, we decided to move to San Antonio, where we set up a different kind of store. What kind? You’ll just have to come in and see. I am absolutely OBSESSED with your store. I wish that I could work there, it would be a dream come true!!! !I have referred so many of my friends to you guys. What a surprise that your shop is so small… Everything in there is amazing. The vision behind it. Even the bathroom & how you have to crawl behind a mirror to get to it. I feel like I’ve fallen down the rabbit hole when I walk inside of your store. I hate leaving every time. I try not to go all too often because all my money would be gone, LOL. KEEP UP THE AMAZING FABULOUS GENIUS WORK! Great choice in ambiance music! Love, love, loved-it! Visiting Atlantis Discovered is more of an experience than a store. It is mystical, mysterious and fun. It is an amazing and fantastic place and the owners are truly beautiful people! They have an over abundance of bridal jewelry and by comparison they are the most inexpensive in town! David’s who??? Trust me ladies if you’re getting married, going to the prom or having a quinceanera you must go to this store. You will have A LOT more variety and will be the belle of the ball.